Here we go again on a new Junkin’ Journey…and this time, I did more than just put a foot in Virginia like I had in Bristol. This go around, Mr. Seasongoods and I packed up the truck and headed to Richmond, VA to explore some new territory and find the best antiques, vintage, and thrift shops around. Richmond has been on our target list for a while now…and when it came time to plan a Spring trip, we decided not to put it off any longer. And now that we’ve been there, I wish it hadn’t taken us so long! 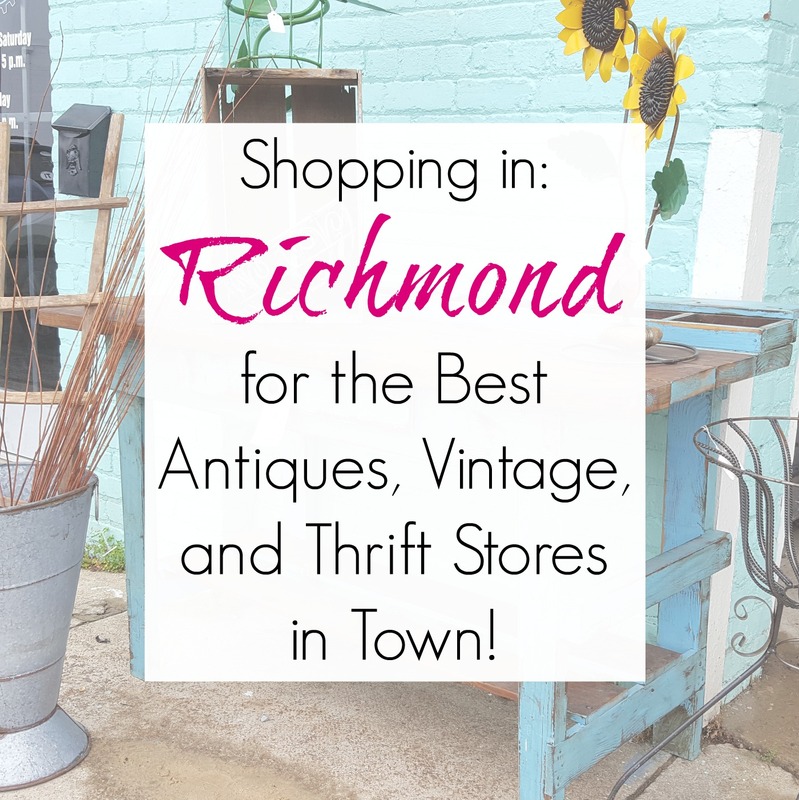 Richmond offered us a lot of what we love- architectural salvage, terrific thrift shops that benefit the local community, a wide variety of ethnic restaurants…all within a few hours’ drive of our home turf. We would, without a doubt, go back in a heartbeat…but until then, let me show you where we went! Caravati’s was one the main reasons I wanted to explore Richmond, VA! 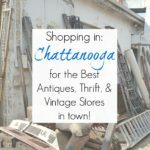 I am SUCH a sucker for architectural salvage- especially amazing stores that are nicely organized (no small feat with salvage! ), well-stocked, and affordable. And you know what? Caravati’s hits all three of those points out of the ball park! We spent a long time walking through both floors of this destination center…and if you’ve watched Richmond Rehabbers on HGTV, then you know how wonderful this store is. I love a shop with a funky, eclectic vibe- especially when it’s well-styled and you can’t train your eyes on a single spot. There was just SO much to look at in this shop, and if you like industrial style…mixed with a little farmhouse decor…with a dash of funk and a sprinkle of weird…then Class and Trash needs to be on your destination list. Class and Trash was truly one of my favorite antique stores in Richmond, VA because of it’s vintage, funky, junk shop vibe. One of the handful of local thrift stores in Richmond, VA that we hit was Diversity Thrift. I am magnetically drawn towards secondhand shops that are lighter on clothing and heavier on housewares and furniture…so Diversity Thrift was a perfect fit for me! I would recommend Diversity Thrift for anyone doing some furniture shopping in Richmond, VA, too – it had one of the best selections of used furniture in the area, and wonderfully priced, too! All my shabby chic/furniture painting lovers, rejoice! I give you RVA Antiques. I was immediately drawn to the aesthetic of RVA Antiques when I was researching our trip…and it did not disappoint once we arrived. The booths are beautifully appointed, leaning mostly towards shabby chic and farmhouse styles, which so many of us love. 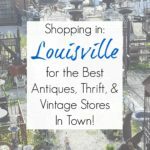 So if you’re shopping in Richmond, VA for farmhouse style decor, RVA Antiques should be at the top of your list. In full disclosure, we visited Governor’s Antiques but couldn’t stay long due to rain. This store is partially indoors (small items, old or antique hardware, etc.) but it’s the huge outdoor yard that is really something to see. So, the rain made things complicated…BUT. Governor’s is truly an experience for architectural salvage in Richmond, VA – I’m just sorry that the weather was uncooperative. So…I have to admit, part of the reason I added this thrift store to the list was because “McAdoo’s” is just a fun word to say out loud! And it turns out, it’s a great thrift-vintage store to poke around in! It’s all housewares, books, and furniture, which is ideal for a DIYer like me, and it is chock full o’ stuff, so there’s a lot to look at. There are many thrift stores in Richmond, VA, but this one is extra special. And, we can personally recommend Addis Ethiopian Cuisine (which was stunningly delicious) and Blue Bee Cider, an urban cidery with a lovely courtyard to enjoy your flights of hard cider on. 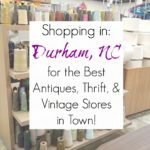 After exploring and junkin’ all day, we had a sublime “date night” at these two places and wanted to share our recommendations with you! 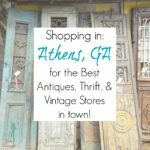 As you know, stores open and close all the time- and at the time this was written (May 2017), these were my favorite antiques, vintage, architectural salvage, and thrift stores in Richmond, VA. Now that several years have passed, I’d love to hear your thoughts. 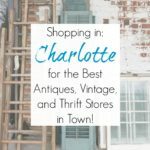 Are there new antiques stores or thrift stores in Richmond that I should check out? I do know that if I ever get back, Scrap RVA will be at the top of my list to check out! Next time you are in Virginia, you’ll have to come to Farmville and check out Mottley Emporium. Think you would totally love it! Check them out on FB. If you do come to the Farmville area check out Jack’s Junk Shop in Cumberland county (6 miles outside of Farmville). You won’t find this listed. It’s kind of a word of mouth place. Wear clothes you can get dirty in and plan on some real climbing over stuff junking! rip and you did not disappoint. I love it and the places you go. A gal with my heart. I am still waiting for you to do a book with your trips. I am from Alabama and love the Southern states that you go to, because it is not a long, long distance and we have so much around here to see. You need to plan some traveling trips and I would be the first to sign up. We would have to get the largest bus available. Thanks again and you don’t know how much it means to see your trips. This is things that me and my two sisters did together and both have passed so it is fun and brings back memories going on travels with you. Oh boy Sarah the thrift stores and secondhand shops near you are sooooo much better than here in California…trust me …….I really would be in junkin heaven as I LOVE to repourpose…..thanks for the pics. 😮 I’m so jealous! I would love to see all those places and be able to load the truck up with goodies to take home. Wow! Thanks for sharing. Too bad I’m so far away; I’d go in a heartbeat! I just love this shop, wish it was nearby. Thank you fr the wonderful pics. 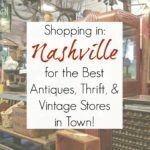 My favorite is the architectural salvage place! Love this blog! Especially since I live in Richmond and the two booth photos you took at RVA Antiques was of Sweetwater Grace. That happens to be my 2 booths I run with 4 other friends! What an awesome thing to share on our Facebook page. Thank you! Martha, I just loved them both and had no clue that they were both run by the same gals! Clearly, I’m a heat-seeking missile to your aesthetic. 🙂 We had a GREAT time exploring Richmond, and I found a new treasures for upcoming DIY repurposing blog posts (which is what my blog is primarily dedicated to). I’ll definitely be returning to Richmond some day!! We loved having you at Caravati’s, Sadie! Thank you for including us on your journey. We hope you will be back. I enjoyed reading about the other finds in Richmond as well. Enjoy your spring and we look forward to seeing you again soon! We would love for you to share pictures of the radiator door after you complete it!! All the best, Elaine and the Caravati Crew! Loved your BLOG! Next time your in Richmond, be sure to visit the heart of Mechanicsville. My daughter has an amazing 10,000 square feet of refurbished, handmade, and awesome treasures. This is her flagship store with over 50 Artisans that have been handpicked to bring the most unique, gift giving, clothing and home decor to any personal space. It is a vintage destination and dream. Red Poppy Pickin’ by Chelsea’s Creations is located at 8167 Mechanicsville Turnpike, located directly behind Cold Harbor Restaurant. We invite you, anytime. We are OPEN 7 days week. Ooooh, thank you for the head’s up! It sounds wonderful! !